TripAdvisorSand Palace before Hurricane Michael. 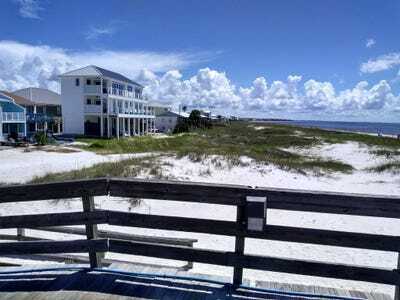 Hurricane Michael obliterated nearly every structure along the coast of Mexico Beach, Florida – except for a few shoddy foundations and one pristine home. With its two-tiered balcony, elevated pillars, and blazing white exterior, the house is a shining example of storm-resistant construction. When its owners, Russell King and Lebron Lackey, built the property in 2017, they installed steel cables and 40-foot pillars designed to withstand flooding and heavy winds. The entire home is made of poured concrete, a common protective feature in South Florida’s hurricane-prone communities. 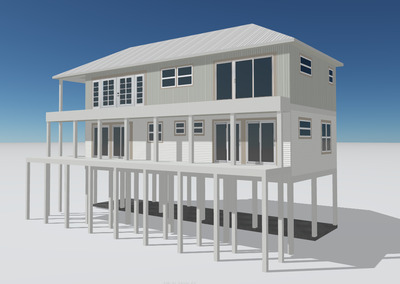 HOVERA 3D rendering of the home. Unlike many properties in the area, the five-bedroom, five-bathroom house – known to its owners as Sand Palace – was built to endure winds of up to 250 mph. The home’s most notable feature are breakaway walls designed to fall off in the event of a hurricane without bringing down the rest of the structure. That’s far more protective outfitting than mandated by the state building code. But these requirements apply only to new construction within a mile of the shore, leaving many buildings ill-equipped to weather a major storm. Properties built before 1992, when Hurricane Andrew barreled through the region, are particularly vulnerable, since the state’s older codes allowed builders to use shoddier materials like particle board and staples to construct roofs. NOAAA satellite image of Mexico Beach, Florida, shows Sand Palace still standing. Leading up to Hurricane Michael, officials guessed that the Panhandle’s acres of trees would slow wind speeds and protect the community from massive damage. But the trees went flying, destroying properties in their path. When Michael’s 155 mph winds hit the area on Wednesday, not even the buildings that followed those regulations survived. Sand Palace could offer some guidance for protecting future properties – at a steep price. The architect behind Sand Palace, Charles Gaskin, told The New York Times that hurricane-resistant features tended to double the cost of construction per square foot. That would make that solution unviable for the Panhandle’s many lower-income residents whose older properties and mobile homes were swept away by the storm.